Most painting and decorating jobs around the house are fairly straightforward and can be easily accomplished with basic straight ladders or stepladders. Stepladders have the benefit of being freestanding, so they do not have to be leant on the surface to be decorated and are easy to move and reposition during work. The tops of walls and ceilings, particularly in modern houses, are easily reached and the double sided design gives greater stability due to increased contact with the ground. 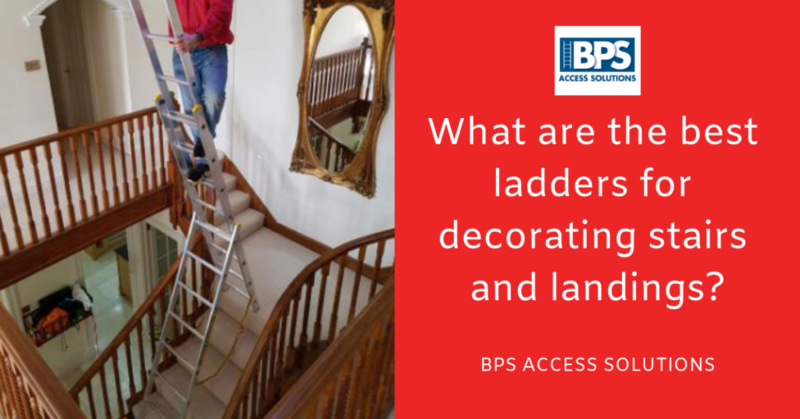 For most decorating jobs in rooms or corridors these are the only requirements the equipment needs to satisfy and for homeowners without access to multiple ladders these can seem ideal. However, at some point it will be necessary to decorate the stairwell and landing areas of the house and this equipment is no longer fit for purpose. Stairs present a variety of problems and hazards not encountered elsewhere in the home during decorating and more flexible, specialised equipment can be needed. Uneven floor surface – The main problem when decorating around stairs, whether indoors or outside, is the lack of a flat, stable surface to erect the ladder. It can be tempting to balance the foot of the ladder on the stairs, but due to the narrow size of each step even a small amount of movement can cause the base to slip off the step, risking a dangerous fall from height onto the stairs themselves. Height – As many stairwells are the height of the two stories they connect, decorating them can involve working at considerable height. This can lead to users overextending ladders and weakening their structural integrity or working too high up the ladder, increasing ‘bounce’ and the risk of falling. Limited space – Most stairwells are narrow and offer limited space to work. Without a freestanding ladder to allow room to manoeuvre and greater reach there is a temptation to overreach and risk falling. This can also make repositioning the ladder multiple times necessary, making the job needlessly complicated and time consuming. Thankfully there are now numerous models of stair ladders for decorating that are specifically designed for this purpose. Combination ladders can be assembled in a number of different of different configurations depending on the job at hand and due to their flexibility can be assembled as traditional straight ladders, as double sided stepladders, or as stair ladders for decorating, making them the ideal choice. This does away with the need for multiple ladders for one decorating project, lowering the cost considerably and saving time transporting and assembling the equipment. They can be easily assembled by one person so are perfect if you are working alone. Not all models have the option of use as stair ladders so this should be checked before purchase. Two section combination ladders for stairs – These consist of a ladder section and an extendable inner section. The two sections can be angled out at the top to form a double sided stepladder with a wide stabiliser bar at the base of the ladder section for added stability. This is then secured with a bolt on steel retaining bar and two nylon leashes to ensure the correct safe angle during use. This makes it ideal for use when decorating landings as the structure is freestanding and narrow but very stable due to increased contact with the ground. For use on staircases the extending section can be raised and locked in place in an inverted ‘y’ shape to form an adjustable ladder for stairs. This allows the stabiliser bar to rest on the ground and the feet of the extension to sit on higher steps, allowing access to higher areas with all the stability of a stepladder and increased reach to the front and sides of the user. Three section combination ladders for stairs –These have a very similar design to the two section model and are erected in the same way, giving all of the same benefits and flexibility. However, they also have a third section that can be extended at the top, giving increased height and therefore increased reach for higher stairwells. This can also be extended in the normal stepladder configuration for decorating landings with especially high ceilings.If a combination ladder with a platform is needed, both models can be fitted with a step platform to increase user comfort. Multipurpose ladders – This type of ladder has a very different construction, consisting of four sections, each connected to the next by two hinges. When not in use it folds up concertina style, making it very portable and easy to store. To open a section, the locking catches on the hinges are depressed, unlocking the hinge and allowing it to move. At certain points in its rotation the hinge will lock in place by means of an internal pin, making a solid connection. If a greater angle is required, the process is repeated until the desired angle is reached. As a result, this type of ladder can be erected in a multitude of configurations, from a straight ladder to a painting platform. Better models come with interlocking platforms that can be attached to give a greater working area with 360 degree reach and space to store materials, speeding up work considerably. Which type of ladder the user chooses obviously depends on several factors, from flexibility of equipment to the design and layout of the area to be decorated. At BPS Access Solutions we stock all of the above models, manufactured from lightweight and hardwearing Aluminium for ease of use and durability, along with a wide range of accessories for any decorating project. All of our products are rigorously tested to ensure they conform to the latest safety standards and come with a free lifetime guarantee. We offer free next day delivery and excellent customer service from our experienced and professional staff. Please visit our website or contact our friendly staff who will be happy to help with any queries or recommendations. PreviousWhat is an extension ladder?